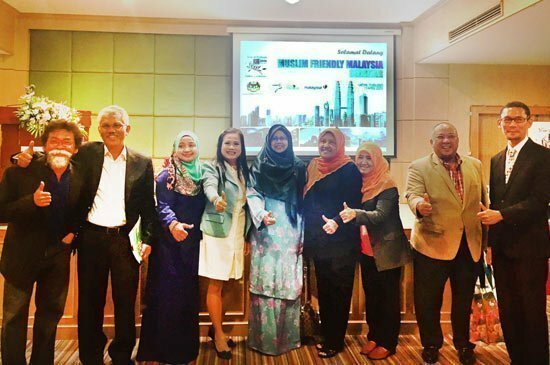 HADYAI, 23 April 2015: The Embassy of Malaysia together with Tourism Malaysia organised a Muslim Friendly Malaysia Seminar in Krabi on the 22nd and in Hatyai on the 23rd April 2015. The two-day seminar offered the perfect platform for Malaysia to update its tourism products specifically to the Thai-Muslim markets in southern Thailand. The seminar was followed by a business to business meeting between seven Malaysian sellers and more than fifty local buyers from Krabi and Hatyai. The seminar was also joined by fifty southern local media representatives from Krabi and Hatyai to promote Malaysia as a prime Muslim-friendly destination. Malaysia not only topped the list of all OIC (Organisation of Islamic Cooperation) destinations, but also ranked first among 100 destinations, based on a report by the MasterCard-Crescent Rating Global Muslim Travel Index for 2015 (GMTI). In fact, the high volume of Thai visitors to Malaysia, especially overland, outlines the importance of Thailand to Malaysia particularly for tourism. According to the Department of Tourism, Ministry of Sports and Tourism Thailand, over 1.3 million Thai nationals predominantly from southern provinces entered Malaysia across land borders. This high volume of visitors in turn would become genuine tourists. “The population in the southern region is mainly Muslims. The close proximity enables the Muslim community here to travel to Malaysia overland with ease; as most hotels and restaurants offer Halal food, and prayer rooms such as surau or masjid are readily available throughout the country.” said Mr. Zulkifly Md. Said, Director General of Islamic Tourism Centre, Malaysia. This year Malaysia is celebrating the Year of Festivals or MyFest 2015. The campaign, with its tagline ‘Endless Celebrations’, intends to give visitors a magical holiday experience with special emphasis on various festivals celebrated by Malaysia’s multicultural society. The campaign targets to receive 29.4 million tourist arrivals and RM89 billion (US$25.45 billion) in tourist receipts. As for the Thai market, Tourism Malaysia has set a target of 1.65 million Thai tourists to visit the country in 2015. Among other dignitaries who attended the seminar were Consul General of Malaysia to Songkhla, Mr. Mohd Faizal Razali and Director of Tourism Malaysia Thailand & Myanmar, Mr. Sulaiman Suip.